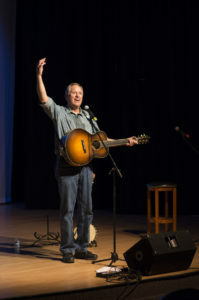 In a career that spans five decades, 24 albums and three GRAMMY awards, Hudson Valley Troubadour Tom Chapin has covered an incredible amount of creative ground. In addition to his work as a recording artist and concert performer, Chapin has acted on Broadway, as well as working extensively in films, television and radio. As a music-maker, the multi-talented singer/songwriter/guitarist has maintained two long and productive parallel careers, both as a highly respected contemporary folk artist and as a pioneer in the field of children’s music. In both roles, Chapin has established a reputation for insightful, heartfelt song craft and effortlessly charismatic live performances. He continues to engage the hearts, minds and imaginations of young listeners with witty, life-affirming original songs delivered in a sophisticated array of musical styles. In either format, Chapin’s infectious songs, sterling musicianship and personal warmth consistently shine through, whether he’s performing on record or in a concert hall, an outdoor festival, a school, in front of a symphony orchestra or in an intimate coffeehouse. Tom’s songs for children are lively, funny, wildly engaging and hold important social messages. During the Building Bridges program Tom plays a variety of instruments including the guitar, banjo and autoharp. Teachers across the country delight in using Tom’s music in their classrooms.